For the geological term, see Diapir. Disposable baby diaper with resealable tapes and elasticated leg cuffs. Different kinds of outer diapers. A diaper (also called a nappy outside North America) is a type of underwear that allows the wearer to defecate or urinate without the use of a toilet, by absorbing or containing waste products to prevent soiling of outer clothing or the external environment. When diapers become soiled, they require changing, generally by a second person such as a parent or caregiver. Failure to change a diaper on a sufficiently regular basis can result in skin problems around the area covered by the diaper. Diapers are primarily worn by infants, and by children who are not yet potty trained or who experience bedwetting. They are also used by adults with incontinence or in certain circumstances where access to a toilet is unavailable. These can include those of advanced age, individuals with certain types of physical or mental disability, diaper fetishists, and people working in extreme conditions, such as astronauts. It is not uncommon for people to wear diapers under dry suits. Unpleasant duties (1631) by Adriaen Brouwer, depicting the changing of a diaper. In 1946, Marion Donovan used a shower curtain from her bathroom to create the "Boater", a plastic cover to be donned outside a diaper. First sold in 1949 at Saks Fifth Avenue's flagship store in New York City, patents were later issued in 1951 to Donovan, who later sold the rights to the waterproof diaper for $1 million. Donovan also designed a paper disposable diaper, but was unsuccessful in marketing it. In 1947, Scottish housewife Valerie Hunter Gordon started developing and making Paddi, a 2-part system consisting of a disposable pad (made of cellulose wadding covered with cotton wool) worn inside an adjustable plastic garment with press-studs/snaps. Initially, she used old parachutes for the garment. She applied for the patent in April 1948, and it was granted for the UK in October 1949. 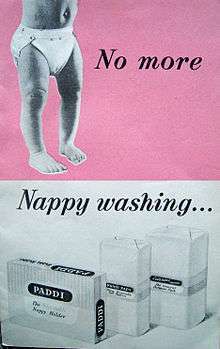 Initially, the big manufacturers were unable to see the commercial possibilities of disposable nappies. In 1948, Gordon made over 400 Paddis herself using her sewing machine at the kitchen table. Her husband had unsuccessfully approached several companies for help until he had a chance meeting with Sir Robert Robinson at a business dinner. In November 1949 Valerie Gordon signed a contract with Robinsons of Chesterfield who then went into full production. In 1950, Boots UK agreed to sell Paddi in all their branches. In 1951 the Paddi patent was granted for the USA and worldwide. Shortly after that, Playtex and several other large international companies tried unsuccessfully to buy out Paddi from Robinsons. Paddi was very successful for many years until the advent of 'all in one' diapers. During the 1950s, companies such as Johnson and Johnson, Kendall, Parke-Davis, Playtex, and Molnlycke entered the disposable diaper market, and in 1956, Procter & Gamble began researching disposable diapers. Victor Mills, along with his project group including William Dehaas (both men who worked for the company) invented what would be trademarked "Pampers". Presented to Fred Wells as 'project p-57' (this was the plane Wells had taught American pilots to fly during the Second World War), Mills stated, "This one will fly." Although Pampers were conceptualized in 1959, the diapers themselves were not launched into the market until 1961. Pampers now accounts for more than $10 billion in annual revenue at Procter & Gamble. Over the next few decades, the disposable diaper industry boomed and the competition between Procter & Gamble's Pampers and Kimberly Clark's Huggies resulted in lower prices and drastic changes to diaper design. They have helped many families with low income to get diapers needed for their babies. Several improvements were made, such as the use of double gussets to improve diaper fit and containment. As stated in Procter & Gamble's initial 1973 patent for the use of double gussets in a diaper, “The double gusset folded areas tend to readily conform to the thigh portions of the leg of the infant. 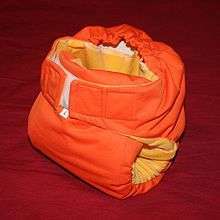 This allows quick and easy fitting and provides a snug and comfortable diaper fit that will neither bind nor wad on the infant…as a result of this snugger fit obtained because of this fold configuration, the diaper is less likely to leak or, in other words, its containment characteristics are greatly enhanced.” Further developments in diaper design were made, such as the introduction of refastenable tapes, the "hourglass shape" so as to reduce bulk at the crotch area, and the 1984 introduction of super-absorbent material from polymers known as sodium polyacrylate that were originally developed in 1966. A baby wearing a disposable diaper. The first disposable diaper was invented and patented in 1948 by Valerie Hunter Gordon (née de Ferranti), granddaughter of inventor Sebastian Ziani de Ferranti. Ever since their introduction several decades ago, product innovations include the use of superabsorbent polymers, resealable tapes, and elasticised waist bands. They are now much thinner and much more absorbent. The product range has more recently been extended into children's toilet training phase with the introduction of training pants and pant diapers, which are now undergarments. Other common features of disposable diapers include one or more pairs of either adhesive or mechanical fastening tapes to keep the diaper securely fastened. Some diapers have tapes which are refastenable to allow adjusting of fit or reapplication after inspection. Elasticized fabric single and double gussets around the leg and waist areas aid in fitting and in containing urine or stool which has not been absorbed. Some diapers lines now commonly include wetness indicators, in which a chemical included in the fabric of the diaper changes color in the presence of moisture to alert the carer or user that the diaper is wet. A disposable diaper may also include an inner fabric designed to hold moisture against the skin for a brief period before absorption to alert a toilet training or bedwetting user that they have urinated. Most materials in the diaper are held together with the use of a hot melt adhesive, which is applied in spray form or multi lines, an elastic hot melt is also used to help with pad integrity when the diaper is wet. Baby cloth diaper filled with extra cloth. Cloth diapers are reusable and can be made from natural fibers, man-made materials, or a combination of both. They are often made from industrial cotton which may be bleached white or left the fiber’s natural color. Other natural fiber cloth materials include wool, bamboo, and unbleached hemp. Man-made materials such as an internal absorbent layer of microfiber toweling or an external waterproof layer of polyurethane laminate (PUL) may be used. Polyester fleece and faux suedecloth are often used inside cloth diapers as a "stay-dry" wicking liner because of the non-absorbent properties of those synthetic fibers. 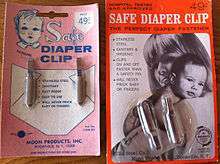 Safe Diaper Clip from the mid-1960s. Most children no longer wear diapers when past two to four years of age, depending on culture, diaper type, parental habits, and the child's personality. However, it is becoming increasingly common for children as old as five to still be wearing diapers because of their parents' neglect or the child's opposition to toilet training. This can pose a number of problems if the child is sent to school wearing diapers, including teasing from classmates and health issues resulting from soiled diapers. Teachers' groups—who are attributing the epidemic to an increase in full-time day care use—are requesting that diapered children be banned from the classroom. The disposable diaper industry has been accused of encouraging this trend by manufacturing diapers in increasingly larger sizes. "[S]uper-comfortable nappies" have also been criticized; the advanced technology in modern diapers wick wetness away from skin, leaving the child oblivious to their accident and when they need to go to the toilet. Paediatric nurse June Rogers claims that the attitude of parents plays a major role in the problem, and that toilet training is simply not a priority for many of them. Children may have problems with bladder control (primarily at night), until eight years or older, and may wear diapers while sleeping to control bedwetting. The Children's Health and Wellness website claims that diapering a child can prolong bedwetting, as it sends a "message of permission" to urinate in their sleep. Dr Anthony Page of the Creative Child Online Magazine claims that children can get used to their diapers and begin to view them as a comfort, and that of the children surveyed, most would rather wear diapers than worry about getting up at night to go to the toilet. In a series of online surveys, Robert A Pretlow, MD, of eHealth International, Inc., cites an identical figure. He argues that if Internet users are representative of society as a whole, these surveys imply that a fetishistic or emotional attraction to diapers may be responsible for these "comfort" cases, and that "these behaviors are a significant cause of enuresis and incontinence." He called for further studies to be done on the topic. Astronauts and Scuba divers utilize diapers for their space suits and dry suits for long exposures. Other animals that are sometimes diapered include female dogs when ovulating and thus bleeding, and monkeys and apes. Diapers are often seen on trained animals who appear on TV shows, in movies, or for live entertainment or educational appearances. An average child will go through several thousand diapers in their life. Since disposable diapers are discarded after a single use, usage of disposable diapers increases the burden on landfill sites, and increased environmental awareness has led to a growth in campaigns for parents to use reusable alternatives such as cloth or hybrid diapers. An estimated 27.4 billion disposable diapers are used each year in the US, resulting in a possible 3.4 million tons of used diapers adding to landfills each year. The environmental impact of cloth as compared to disposable diapers has been studied several times. In one cradle-to-grave study sponsored by the National Association of Diaper Services (NADS) and conducted by Carl Lehrburger and colleagues, results found that disposable diapers produce seven times more solid waste when discarded and three times more waste in the manufacturing process. In addition, effluents from the plastic, pulp, and paper industries are far more hazardous than those from the cotton-growing and -manufacturing processes. Single-use diapers consume less water than reusables laundered at home, but more than those sent to a commercial diaper service. Washing cloth diapers at home uses 50 to 70 gallons (approx. 189 to 264 litres) of water every three days, which is roughly equivalent to flushing the toilet 15 times a day, unless the user has a high-efficiency washing machine. An average diaper service puts its diapers through an average of 13 water changes, but uses less water and energy per diaper than one laundry load at home. 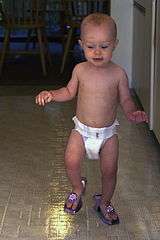 Another aspect to consider when choosing between disposable diapers and cloth diapers is cost. It is estimated that an average baby will use from $1,500 to $2,000 or more in disposable diapers before being potty-trained. In contrast, cloth diapers, while initially more expensive than disposables, cost as low as $300 for a basic set of cloth diapers, although costs can rise with more expensive options. The cost of washing and drying diapers must also be considered. The basic set, if one-sized, can last from birth to potty-training. ↑ "Diaper". Webster's Dictionary. The University of Chicago Department of Romance Languages and Literature. Retrieved 2 April 2013. ↑ Oxford English Dictionary – "Diaper"
↑ "Nappy". Oxford English Dictionary. ↑ Peter White (2000) From Pillboxes to Bandages... ...and Back Again. The Robinson Story 1839–2000. ↑ "No. 2464: Engineering Diapers". uh.edu. ↑ "The Politics of Diapers". Retrieved March 17, 2008. ↑ "Pampers: The Birth of P&G's First 10-Billion-Dollar Brand". ↑ "Free Diapers For Low Income". Free Diapers For Low Income Families. Retrieved December 11, 2008. 1 2 Mario S Marsan. "Disposable Diaper", US Patent 3710797, Issued January 16, 1973. ↑ "The disposable diaper and the meaning of progress – a brief history of diaper manufacturing". The New Yorker. Retrieved November 11, 2008. ↑ "The disposable diaper industry source – diaper history time line". Richer Investment. Archived from the original on July 23, 2011. Retrieved February 14, 2009. ↑ "The History of Paddi". paddi.org.uk. Retrieved August 1, 2012. ↑ BBC – Radio4. "Home truth – Nappy days". Retrieved October 20, 2011. ↑ "How disposable diaper is made". How Products Are Made. Retrieved March 17, 2008. ↑ "What are the components used on a typical disposable diaper". Diaper Industry Source. Archived from the original on July 23, 2011. 1 2 Leah S. Leverich (August 4, 2011). "Improved containment and convenience in a double gusset cloth diaper: Method of manufacture". ↑ "Cloth Diapering". Retrieved March 17, 2008. ↑ Diapering Your Baby. Kidshealth.org. Retrieved on April 9, 2013. ↑ Diaper Changes – Gentle Child Care. Keepkidshealthy.com (December 8, 2004). Retrieved on April 9, 2013. ↑ Diaper Rash: The Bottom Line. Uspharmacist.com. Retrieved on April 9, 2013. 1 2 3 Delayed Toilet Training Issues. Dy-dee.com. Retrieved on April 9, 2013. ↑ Larkin, Patrick (July 22, 1998). "P&G announces Pampers now a bigger disposable". The Cincinnati Post. E. W. Scripps Company. Archived from the original on May 8, 2006. ↑ Davies, Hannah (June 5, 2008). "Kids at school in nappies". The Courier-Mail. Retrieved June 5, 2008. ↑ Hannah Davies (June 5, 2008). "Parents sending kids to school in nappies". The Courier-Mail. Archived from the original on June 28, 2009. Retrieved June 5, 2008. ↑ Lois Rogers (June 17, 2008). "Absolutely potty! How children are still wearing nappies to SCHOOL – with dire risks to their health". The Daily Mail. Retrieved August 3, 2008. ↑ The Bed Wetting Diaper. Bedwettingweb.com (February 12, 2007). Retrieved on April 9, 2013. ↑ Bedwetting and diapers. Drpaul.com. Retrieved on April 9, 2013. ↑ The Bed-Wetting Report – Do diapers prolong bedwetting?. Creativechildonline.com. Retrieved on April 9, 2013. ↑ Pretlow, Robert A. "The internet can reveal previously unknown causes of medical conditions, such as attraction to diapers as a cause of enuresis and incontinence". Mednet 2002. Archived from the original on February 17, 2006. ↑ Stack, Jennie Borodko (February 2001). "When You've Gotta Go, You've Gotta Go". Muscular Dystrophy Association. Retrieved January 3, 2008. ↑ Gerbis, Nicholas. "How did NASA change diapers forever?". How Stuff Works. Retrieved April 4, 2013. ↑ Harris, Richard (December 2009). "Genitourinary infection and barotrauma as complications of 'P-valve' use in drysuit divers". Diving and Hyperbaric Medicine. 39 (4): 210–2. PMID 22752741. Retrieved April 4, 2013. ↑ "Row as horses told to wear nappies". BBC News. September 20, 2002. Retrieved February 21, 2008. ↑ "Anger at Kenya donkey nappy plan". BBC News. July 17, 2007. Retrieved February 21, 2008. ↑ "Blackpool horses to get nappies". BBC News. October 17, 2006. Retrieved February 21, 2008. ↑ "Nappy plan for Blackpool horses". BBC News. November 13, 2007. Retrieved February 21, 2008. ↑ "Horse nappy plan given go-ahead". BBC News. November 22, 2007. Retrieved February 21, 2008. ↑ "Welcome". babycottonbottoms.com. Retrieved October 7, 2010. ↑ "Cloth Diapers Vs Disposable.?". Cloth-Diaper.org. Retrieved September 14, 2010. ↑ Paul, Pamela (January 10, 2008). "Diapers Go Green". Time. Retrieved January 12, 2008. ↑ Carl Lehrburger; C. V. Jones; Jocelyn Mullen (1991). Diapers: Environmental Impacts and Lifecycle Analysis. C. Lehrburger. ↑ "The UK Environment Agency / DEFRA study" (PDF). randd.defra.gov.uk. ↑ "Science and Research Projects" (PDF). randd.defra.gov.uk. Retrieved October 7, 2010. ↑ "Windeln im Test – Unabhängiges Vergleichsportal". www.windeln-tests.de. Retrieved 20 June 2016. ↑ Consumer Reports (July 8, 2009). "Cloth vs. disposable diapers: Getting started". Consumer Reports. Retrieved Nov 15, 2010. ↑ "Diaper Facts". Real Diaper Association. Retrieved Nov 15, 2010. ↑ "Waste Management". The Washington Post. Oct 21, 2007. Retrieved Nov 15, 2010. Look up diaper in Wiktionary, the free dictionary. Wikimedia Commons has media related to Diaper.